On a cold, wet winter’s day, four weeks before Christmas, builder Michael Bennett broke ground on his new site – Madeira Oaks – in Enniscorthy, Co Wexford. 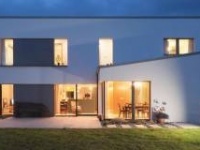 Bennett had been building low energy houses since 2007, and by this time, he was the veteran of several high profile passive builds, including former European Parliament president Pat Cox’s house in Blackrock, Co Dublin and the passive development at Grange Lough in Rosslare, Co Wexford, both of which featured in this magazine. Madeira Oaks however, would be different. Not alone (only) would the twelve houses in the development be certified passive, they would also be affordable. Three of the houses which will be completed this year have already been sold. The price? €170,000 a piece, for three-bed semi-Ds of 102 sqm each. These houses mark the culmination of years of research and building experience, says Bennett. He cites the expertise of the trained crew he’s worked with throughout that time, plus the dedication and support of one of the country’s pre-eminent passive architectural practices, MosArt, as vital in realising his long-held dream. Donal Mullins of Shoalwater Timberframe, who has also worked with Bennett throughout this time, says that one further ingredient has been vital in keeping costs down: simplicity. Interestingly, despite the fact that Bennett’s ambition centred on first time buyers, all three of the first phase houses were sold to retired women. When you think about it, he points out, that makes perfect sense. Then there are the comfort levels. Ray McGahern moved into his Bennett-built low energy house four years ago. Prior to that, he’d been living in a 60s era cavity block house on the same site. 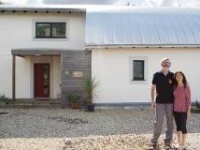 Anne Mahon moved into her Bennett-built passive house in Grange Lough in Rosslare just over a year ago. Like Ray McGahern, she found it impossible to heat her previous home, a 1940s era house in Terenure in Dublin. In Rosslare, the only radiators are in the bathrooms, and these are rarely used. Backup comes from a room-sealed stove in the living room. Mahon says she lights this mainly because she likes the look of the fire. The comfort levels are so good, says Ray McGahern, that he would happily pay a premium for running costs. In practise of course, the opposite is true. The design and build team estimate that the total annual cost for water and space heating in Madeira Oaks – to be provided by a Nilan Compact P, which combines an exhaust air heat pump and heat recovery unit to provide heating, cooling, ventilation and hot water – will come in at under €200. However, a photovoltaic array from Solar Electric Ireland on the roof of each house is expected to yield €200 worth of savings to electricity bills, effectively wiping out the Nilan unit’s parsimonious electricity costs for space and water heating. It’s not only the calculated energy costs that are freakishly low at Madeira Oaks: measured noise levels are bound to be low too. Changes introduced to Part E of the Irish building regulations in 2014 mean that sound insulation levels must be measured at party walls between new homes, and must hit a target of 53 db or higher. The test at Madeira Oaks gave results of 66 and 69 decibels. While the tests indicate the houses will keep out well over twice the noise levels specified under the regulations, Dalton puts that performance in context. “The higher result [of 69db] is akin to the kind of sound insulation we attempt to design into walls between commercial cinemas.” An experienced and prolific tester of housing, Dalton is clearly impressed with the result at Madeira Oaks. “I’ve never seen a result like this on a party wall,” he says, a performance level affected by the general quality of the building envelope. But this high level of performance was in large part due to the party wall spec. Cellulose insulation, which is used throughout the building’s walls and roof, is well-known for its acoustic properties. At the party wall this is followed by Coillte’s newly developed VapAirTight OSB, under Gyproc Plank – a 19mm version of Gyproc’s Wallboards, which itself boasts sound insulation benefits, followed by a layer of standard 12.5mm Gyproc Wallboard, with the joints of the two layers deliberately staggered to reduce sound transmission, and a sealant used at floor and ceiling level. Bennett’s insurer, Creane & Creane Insurance in Enniscorthy, is offering home insurance free for the first year to the new owners. Bennett says that when he took the company MD, Tony Doyle, on a tour of the house, Doyle zeroed in on unlikely elements of the build. Bennett provides a manual with every house sold. In addition to comprehensive information on how to operate everything in the house, it also contains contact details for everyone involved in the build. He’s keen to point out however that he used to do the same thing when he built non-passive housing. 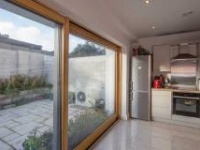 Living in a passive house isn’t really any different to living in a conventional house. Bennett admits that his profit margins on these houses are low. The €170,000 price was chosen in part to get the development launched, and in part to prove a point – that affordable passive is possible. If the prices of the homes at Madeira Oaks are impressively low, they’re even moreso when viewed in context. Last September, the Society of Chartered Surveyors Ireland – the representative body for surveyors, including quantity surveyors – launched a report for government on the policy options available to enable the delivery of affordably priced housing in a market where demand is far outstripping supply. The report cited an example of a typical three-bed Dublin house – as luck would have it, the same basic house type as the homes at Madeira Oaks, albeit coming in at a marginally larger 110 sqm. The total development cost, excluding land prices, but including all other costs –house construction, external works, site development costs, indirect costs, profit margin, fees, levies and taxes – added up to €256,000, based on 2014 prices. More starkly, if the overall construction costs inclusive of VAT are added up (but not counting fees for an assigned certifier under the building control regulations, consultant design fees, marketing, finance, development levies and contributions, and VAT on each of these elements) the total comes to over €171,000 – more than the asking prices for certified passive houses with net zero heating and hot water bills at Madeira Oaks. Civil / Structural engineer: Arthur Murphy & Co. Plumbing Electrical contractor: Doyle Bros. Build system & cellulose insulation: Shoalwater Timberframe Ltd.
Windows and doors: Munster Joinery Ltd.
Heat pump & MVHR: Nilan Ireland Ltd. Roof tiles & concrete: Dan Morrissey & Co.
Development type: 12 unit scheme, consisting of 102 square metre, 3-bed, semi-detached two-storey timber frame houses constructed to certified passive house standards. Location: Madeira Oaks, The Moyne, Enniscorthy, Co Wexford. Completion date: The first two houses (No. 177&178) will be completed end of March 2016. BER: Provisional BER Certificate of A2, Final Cert. awaited. 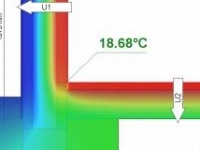 Thermal bridging: All detailing of thermal bridging are in excess of ACDs. Heating/ventilation system: Nilan Compact P unit, Passive House Institute certified, combining mechanical heat recovery ventilation with hot water generation and storage, backed up with an additional 1 kW of secondary space heat generation. MVHR heat recovery efficiency at 80%. Renewables: Solar photovoltaic array provided by Solar Electric Ireland with an expected output of between 750-1100kWh/a. 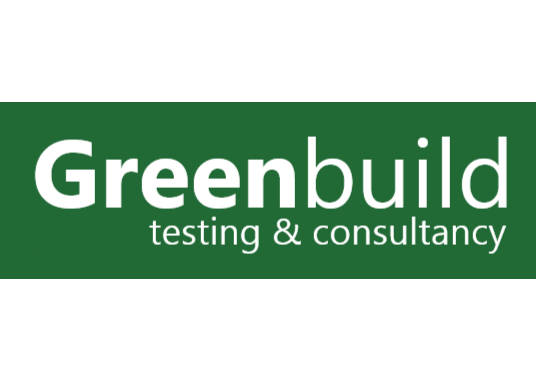 Experts in working with you to achieve passive house and low-energy designed buildings using mechanical heat/cooling systems, solutions and designs.